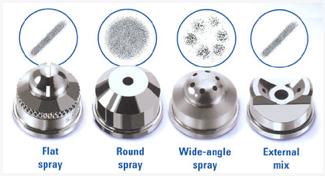 Air atomizing nozzles produce the finest mist of any nozzle type. Air and liquid is mixed at the spray tip to create the spray pattern. External spray set ups are ideal for spraying viscous liquids .The fluid line can be pressurized or supplied using a siphon or gravity fed configuration. Avaliable with cleanout and shut off needles.